Staphylococcus aureus and Pseudomonas aeruginosa are often found together in the airways of cystic fibrosis (CF) patients. It was previously shown that the P. aeruginosa exoproduct 4-hydroxy-2-heptylquinoline-N- oxide (HQNO) suppresses the growth of S. aureus and provokes the emergence of small-colony variants (SCVs). The presence of S. aureus SCVs as well as biofilms have both been associated with chronic infections in CF. We demonstrated that HQNO stimulates S. aureus to form a biofilm in association with the formation of SCVs. The emergence of SCVs and biofilm production under HQNO exposure was shown to be dependent on the activity of the stress- and colonization-related alternative sigma factor B (SigB). Analysis of gene expression revealed that exposure of a prototypical S. aureus strain to HQNO activates SigB, which was leading to an increase in the expression of the fibronectin-binding protein A and the biofilm-associated sarA genes. Conversely, the quorum sensing accessory gene regulator (agr) system and the α-hemolysin gene were repressed by HQNO. Experiments using culture supernatants from P. aeruginosa PAO1 and a double chamber co-culture model confirmed that P. aeruginosa stimulates biofilm formation and activates SigB in a S. aureus strain isolated from a CF patient. Furthermore, the supernatant from P. aeruginosa mutants unable to produce HQNO induced the production of biofilms by S. aureus to a lesser extent than the wild-type strain only in a S. aureus SigB-functional background. These results suggest that S. aureus responds to HQNO from P. aeruginosa by forming SCVs and biofilms through SigB activation, a phenomenon that may contribute to the establishment of chronic infections in CF patients. Although cystic fibrosis (CF) is fundamentally a genetic disorder, the majority of patients with CF may ultimately succumb to respiratory failure subsequent to chronic bacterial infections . In early childhood, lungs of CF patients are often infected with Staphylococcus aureus and Haemophilus influenzae, but these organisms are usually outnumbered by Pseudomonas aeruginosa as patients become older. However, S. aureus often persists in the airways of CF patients and the role of S. aureus in the progression of CF patients to respiratory failure is not yet understood whereas infections with P. aeruginosa is considered as one of the main factors for a decline in lung function and mortality . Interestingly, both organisms are commonly co-isolated from CF airways [2, 3]. Infections with mixed microbial communities are common, although very little is known about the importance and the impact of interspecies interactions . It is now becoming obvious that the different bacteria found in CF airways interact together in several different ways [5–10]. One possibility is that polymicrobial interactions influence pathogenic processes such as biofilm formation [1, 9]. Accordingly, the biofilm lifestyle is now recognized as an integrated and complex polymicrobial community and it is thought that cell-to-cell interspecies signals play a role in the control of this behavior . It has recently been shown that prolonged growth of S. aureus with physiological concentrations of the P. aeruginosa exoproduct 4-hydroxy-2-heptylquinoline-N-oxide (HQNO) selects for a sub-population of slow-growing respiratory deficient S. aureus named small-colony variants (SCVs) . The respiratory deficiency of SCVs provides resistance to aminoglycoside antibiotics, which can contribute to microbial persistence during antibiotherapy . Furthermore, it has been recently demonstrated that SCV selection is a survival strategy of S. aureus against P. aeruginosa . S. aureus SCVs are often isolated from chronic infections , as in the case of lung infections of CF patients [14–16]. Several studies have shown that S. aureus SCVs possess an increased capacity to invade and persist in host cells [14, 15, 17], which is thought to confer the bacterium protection against the immune system and the action of antibiotics [17, 18]. Using SCVs isolated from cystic fibrosis patients, we have previously demonstrated that the alternative transcription sigma factor B (SigB) influences the expression of several virulence factors and is associated with an increased ability to adhere, invade and persist within host cells [15, 19]. Furthermore, our more recent results suggest that SigB is involved in the emergence of SCVs under aminoglycoside pressure , which suggests that the appearance of SCVs may be a regulated process influenced by environmental cues. Our current hypothesis is that SigB plays an important role in the establishment of chronic and difficult-to-treat S. aureus infections. SigB is involved in the response to environmental stresses such as during stationary phase, heat exposure and change in osmotic pressure . Moreover, the activity of SigB positively influences the expression of several cell-surface proteins whereas it down-regulates a variety of toxins , which suggest an important role for SigB in pathogenesis. The effect of SigB on virulence gene expression can be direct or indirect, since the genes regulated by SigB also include at least another global regulator of virulence, sarA (Staphylococcal accessory regulator) [22, 23]. SarA modulates the expression of several virulence factors either by stimulating RNAIII transcription or by pathway(s) independent of the agr (accessory gene regulator) system . In turn, it is proposed that the quorum-sensing agr system controls the transition from colonization to dissemination by up-regulating the expression of several exotoxins and proteolytic enzymes and by repressing the expression of cell-surface proteins involved in colonization . agr , SigB [27, 28] and SarA  are known to influence the formation of biofilms by S. aureus. At least two different mechanisms of biofilm formation exist in S. aureus [26, 29–33]. The first mechanism implies the production of the polysaccharide intercellular adhesin (PIA), which requires the ica gene cluster, whereas the second mechanism is ica-independent. With opposite effects, SarA and agr are both involved in the ica-independent mechanism of biofilm formation. SarA is thought to be indirectly required for the initial attachment step to biological matrices [29, 32, 33], while agr is controlling the dispersal process of biofilms . Recently, Lauderdale et al. have shown that SigB is an essential regulator of the ica-independent biofilm formation and suggested that SigB acts upstream of the agr system, allowing the formation of biofilm to be regulated as a function of environmental factors. Noteworthy, biofilms have been linked to chronic infections, especially in the case of those found in the airways of CF patients [1, 34], and an increased formation of biofilms has been associated with the SCV phenotype [20, 35]. The aim of this study was to investigate the association between the activity of SigB, the emergence of SCVs and biofilm production in S. aureus when exposed to P. aeruginosa HQNO. Fig. 1 confirms that HQNO suppresses the growth of S. aureus and causes the emergence of SCVs. Isolates CF1A-L and CF1D-S are two related strains co-isolated from a CF patient which have a normal and a SCV phenotype, respectively (see Methods). At a concentration of 10 μg/ml, HQNO significantly attenuated the growth of CF1A-L (P < 0.01 from 6 to 12 h of growth; two-way ANOVA followed by a Bonferroni's post test) whereas HQNO had no apparent effect on the growth of CF1D-S which was already significantly slower than that of CF1A-L in the absence of HQNO (P < 0.001 from 6 to 12 h of growth; two-way ANOVA followed by a Bonferroni's post test) (Fig. 1A). Similar observations were also reproduced with other strains (two normal and one SCV; data not shown). Fig. 1B shows that an overnight treatment with HQNO provokes the emergence of SCVs from CF1A-L, as determined by plating the culture on solid medium containing a concentration of gentamicin selective for the SCV phenotype. Very little or no SCV were detected on gentamicin plates when cultures were not exposed to HQNO (Fig. 1B). Hence, this technique allowed detection and quantification of SCVs emerging during the growth of normal bacteria exposed or not to HQNO. This approach was thus used to distinguish the transitory suppression of growth of normal S. aureus by HQNO from the emerging slow-growing SCVs for which gentamicin resistance and slow growth persist even after removal of HQNO. Fig. 1C shows that 10 μg of HQNO/ml significantly increased the presence of SCVs in cultures of the prototypical strains ATCC 29213, Newman and Newbould as well as of the other normal strains isolated from CF patients CF03-L, CF07-L and CF1A-L. Differences in HQNO-mediated SCV emergence between strains were not significant, except between ATCC 29213 and Newbould (P < 0.01; one-way ANOVA followed by a Tuckey's post test). These results corroborate that HQNO generally suppresses the growth of normal S. aureus populations and provokes the emergence of SCVs from strains of different origins. HQNO inhibits the growth of normal S. aureus strains and provokes the emergence of SCVs. (A) Growth curves of the normal strain CF1A-L (□) and the SCV CF1D-S (●) exposed (dotted lines) or not (solid lines) to 10 μg/ml of HQNO. (B) Pictures show SCV colonies grown on agar containing a selective concentration of gentamicin following or not an overnight treatment of strain CF1A-L with 10 μg/ml of HQNO. (C) Relative number of SCV CFUs recovered after 18 h of growth from strains ATCC 29213, Newman, Newbould, CF03-L, CF07-L and CF1A-L following (black bars) or not (open bars) treatments with 10 μg/ml of HQNO. Data are presented as means with standard deviations from at least three independent experiments. Results are normalized to the non exposed condition for each strain (dotted line). Significant differences between untreated and HQNO-treated conditions are shown (*, P < 0.05; **, P < 0.01; ***, P < 0.001; unpaired t- test). Several pairs of related normal and SCVs strains were used in order to study the effect of HQNO on biofilm production by S. aureus. Fig. 2A shows that SCVs produce significantly more biofilm than their normal counterparts. The use of the strain NewbouldhemB (which is a stable laboratory-derived SCV) ensured that SCVs (and not revertants) are indeed responsible for this increase in biofilm production (at least in the case of NewbouldhemB). Furthermore, as shown in Mitchell et al. , supplementation of the SCV strains CF03 and CF07 with menadione abolished this phenomenon and thus demonstrated that if there was a reversion of SCVs to the normal phenotype, the biofilm production would be greatly reduced. HQNO stimulates biofilm production in normal strains but does not alter high biofilm production in SCVs. (A) Relative biofilm production in related normal (open bars) and SCV (grey bars) strains. Results are normalized to the normal strain for each pair (dotted line). (B) Pictures show the biofilm formation of the normal strain CF1A-L in the absence or in the presence of HQNO as detected by crystal violet staining. (C) Relative biofilm production in strains exposed (black bars) or not (open bars) to 10 μg/ml of HQNO. Results are normalized to the unexposed condition for each strain (dotted line). Data are presented as means with standard deviations from at least three independent experiments. Significant differences between normal and SCV strains (-L and -S suffixes, respectively) or between unexposed and HQNO-exposed conditions are shown (*, P < 0.05; **, P < 0.01; ***, P < 0.001; unpaired t- test). Besides, the presence of HQNO at 10 μg/ml did stimulate biofilm production in the normal strains (Fig. 2B-C). This observation was statistically significant for the normal strains ATCC 29213, Newman, Newbould, CF03-L, CF07-L and CF1A-L whereas HQNO had no detectable effect on the already high biofilm production of the SCV strains NewbouldhemB, CF03-S, CF07-S and CF1D-S (Fig. 2C). Moreover, CF03-L produced significantly more biofilm than ATCC 29213 and Newman in presence of HQNO, revealing that the amplitude of the response of normal strains to HQNO may individually differs (Fig. 2C). Interestingly, an overnight exposure to 10 μg/ml of HQNO resulted in a significant increase in biofilm production (P < 0.05) for strain Newman, CF03-L and CF1A-L even after sub-culturing strains in HQNO-free medium (data not shown). This indicates that an exposure of S. aureus to HQNO may result in a sustained increase in biofilm production. Overall, these results suggest that HQNO increases biofilm production in normal S. aureus strains and that the sustained effect of HQNO on biofilm production in subsequent HQNO-free medium may result from the relative increase in the sub-population of SCVs which are good biofilm producers. Strains Newbould and NewbouldΔsigB were used to determine whether SigB is involved in the emergence of SCVs and biofilm production under an exposure to HQNO. Fig. 3A illustrates the ability of HQNO (10 μg/ml, overnight) to favor the emergence of the SCV phenotype only in a sigB+ background. HQNO significantly increased the presence of SCVs in strain Newbould, but not in NewbouldΔsigB (Fig. 3B). This result was confirmed with strains SH1000 and 8325-4 (data not shown), which are isogenic strains with a functional and dysfunctional SigB system, respectively . Fig. 3C demonstrates that the presence of HQNO significantly inhibits the growth of both Newbould and NewbouldΔsigB (P < 0.05 at 24 h of growth for both; two-way ANOVA followed by a Bonferroni's post test). However, the ability of HQNO to increase biofilm formation was observed with strain Newbould, but not with NewbouldΔsigB (Fig.3D). These results suggest that, even if the inhibition of growth caused by HQNO is not influenced by SigB (Fig. 3C), HQNO-mediated emergence of SCVs and biofilm production is triggered by a SigB-dependent mechanism (Fig. 3D). SigB is involved in HQNO-mediated emergence of SCVs and biofilm production. (A) Pictures show SCV colonies grown on agar containing a selective concentration of gentamicin following or not an overnight exposure to 10 μg/ml of HQNO for strains Newbould and NewbouldΔsigB. (B) Relative number of SCV CFUs recovered after 18 h of growth for strains Newbould and NewbouldΔsigB in the presence (black bars) or not (open bars) of 10 μg HQNO/ml. Results are normalized to unexposed Newbould (dotted line). Data are presented as means with standard deviations from at least three independent experiments. Significant differences between unexposed and HQNO-exposed conditions (*, P < 0.05), and between strains in the same experimental condition (Δ, P < 0.05) were revealed by a one-way ANOVA with tuckey's post test. (C) Growth curves of Newbould (□) and NewbouldΔsigB (●) exposed (dotted lines) or not (solid lines) to 10 μg/ml of HQNO. (D) Relative biofilm formation as a function of the concentration of HQNO for strains Newbould (open bars) and NewbouldΔsigB (grey bars). Results are normalized to the unexposed condition for each strain (dotted line). Data are presented as means with standard deviations from two independent experiments. Significant differences between Newbould and NewbouldΔsigB for each concentration of HQNO are shown (*, P < 0.05; **, P < 0.01; two-way ANOVA with bonferroni's post test). Fig. 4 shows qPCR measurements of the expression of the genes asp23, fnbA, hld (RNAIII), hla, sarA and gyrB at the exponential growth phase for strains Newbould and NewbouldΔsigB exposed or not to HQNO. The expression of asp23 and fnbA was evaluated in order to verify the hypothesis that SigB is activated during HQNO exposure. The gene asp23 is a well-known marker for SigB activity as for the gene fnbA, although the transcription of the latter is not exclusively influenced by SigB [15, 19, 22, 37]. Fig. 4A and 4B show that HQNO at 10 μg/ml induced SigB activity in strain Newbould, as revealed by significant increases of asp23 and fnbA expression. The effect of HQNO on the expression of asp23 and fnbA was further confirmed with the sequenced strain Newman (data not shown). These results suggest that SigB activity is increased by HQNO. 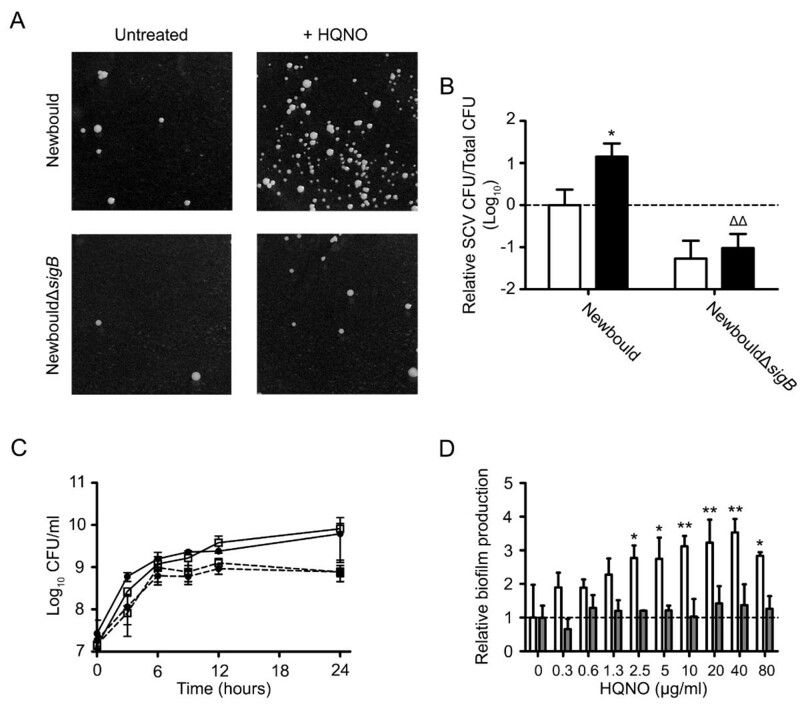 SigB and agr activities are modulated by an exposure to HQNO. Relative expression ratios for the genes asp23 (A), fnbA (B), hld (C), hla (D), sarA (E) and gyrB (F) were evaluated by qPCR for strains Newbould and NewbouldΔsigB grown to the exponential phase in the presence (black bars) or in the absence (open bars) of 10 μg/ml of HQNO. Results are normalized to unexposed Newbould (dotted line). Data are presented as means with standard deviations from at least three independent experiments. Significant differences between the unexposed and HQNO-exposed conditions (*, P < 0.05; ***, P < 0.001) and between Newbould and NewbouldΔsigB for the same experimental condition (Δ, P < 0.05; ΔΔ, P < 0.01; ΔΔΔ, P < 0.001) were revealed by one-way ANOVA followed by the tuckey's post test. The activity of the agr system is known to be reduced in SCVs [15, 38–41]. We have thus hypothesized that HQNO exposure would repress the agr quorum-sensing system due to the general suppression of growth toward normal strains (likely mediated through the inhibition of the electron transport chain by HQNO ) but also due to the overall emergence of the SCV sub-population as seen in Fig. 1. Indeed as expected, Fig. 4C shows that exposure of Newbould and NewbouldΔsigB to HQNO significantly repressed the expression of hld (the effector of the agr system). With the increased in SigB activity and the reduced expression of agr observed under exposure to HQNO, it was also justified to measure the expression of the α-hemolysin gene hla which can be influenced by both agr and SigB [36, 43]. hla was only significantly repressed in Newbould and not in NewbouldΔsigB by the presence of HQNO (Fig. 4D). Furthermore, the expression of hla was, in both exposed and unexposed conditions, significantly increased in NewbouldΔsigB in comparison to Newbould, which confirms the negative influence of SigB on hla expression . These results show that the expression of hla is reduced by HQNO and that the influence of SigB on hla expression under HQNO exposure seems to be predominant over the agr system. The expression level of sarA was also measured because of its partial dependency on SigB for expression [22, 23], and its roles in the regulation of virulence factors expression  and in biofilm formation . Fig. 4E shows that sarA expression is significantly induced by HQNO in strain Newbould but not in NewbouldΔsigB. The specificity of the observed modulations in gene expression was validated by monitoring the impact of HQNO on the expression of the housekeeping gene gyrB. The expression of gyrB was not modulated in the different conditions tested (Fig. 4F). These results suggest that HQNO induces the expression of sarA by a SigB-dependent mechanism. 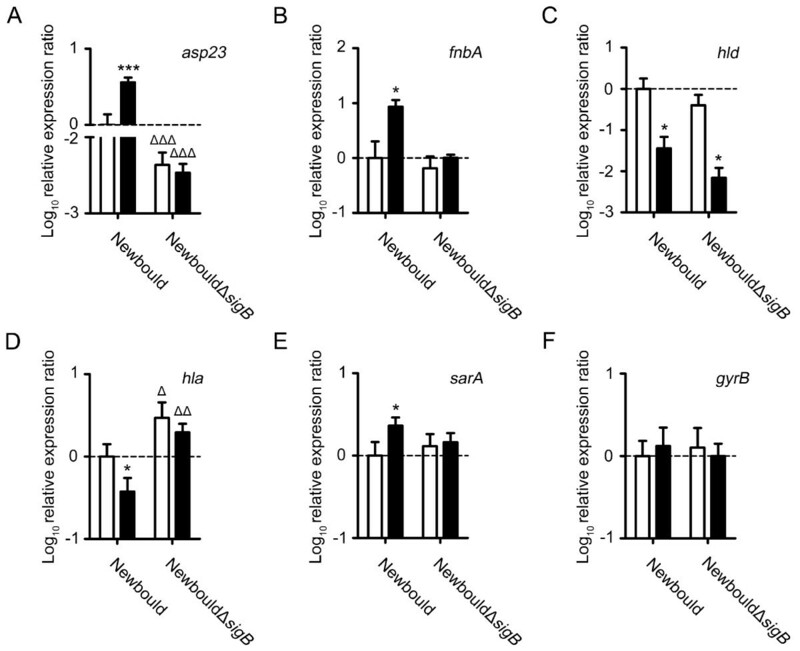 Overall, these results suggest that exposure of S. aureus to HQNO reproduces the transcriptional signature found in SCVs [12, 15, 19, 20, 41] and stimulates biofilm production by having opposite effects on the activity of SigB (up) and agr (down) as well as on the expression of sarA (up by a SigB-dependent mechanism). In order to ascertain that the effect of HQNO on S. aureus is representative of what may happen when P. aeruginosa and S. aureus are in close proximity during a co-infection, we conducted experiments in which S. aureus was exposed to supernatants from overnight cultures of P. aeruginosa as well as experiments using a double chamber co-culture model. We used the E. coli strain K12 in control experiments to ensure that the observed effect was specific to P. aeruginosa and was not only caused by the close proximity of a Gram-negative bacterium or non specific alterations of the growth medium. We used E. coli because it is known that this bacterium does not produce HQNO (E. Déziel, unpublished data). Fig.5A shows that P. aeruginosa PAO1 inhibits the growth of the S. aureus strain CF1A-L whereas this phenomenon was not observed with E. coli K12. The supernatant collected from an overnight culture of PAO1 significantly inhibited the growth of S. aureus. This growth inhibition was accompanied by a significant increase in biofilm production (Fig. 5B). Fig. 5C shows that when S. aureus CF1A-L was co-cultured with PAO1 for 6 h, significantly more SCVs were recovered than that seen when the co-culture was done with E. coli K12. Of striking interest, the co-cultivation of S. aureus CF1A-L with P. aeruginosa PAO1 specifically and significantly increased the expression of asp23. These results confirm that P. aeruginosa has the potential to specifically inhibit the growth, stimulate biofilm production, favor the emergence of the SCV phenotype and increase the activity of SigB in non-SCV S. aureus strains. P. aeruginosa stimulates biofilm formation and increases the activity of SigB of a S. aureus CF isolate. (A) CFU/ml recovered after 48 h of growth of CF1A-L (open bar) and CF1A-L in the presence of supernatants from overnight cultures of P. aeruginosa PAO1 (black bar) or of E. coli K12 (hatched bar). The picture shows the specific inhibitory effect of P. aeruginosa on the growth of S. aureus. (B) Relative biofilm production by CF1A-L grown in the presence of supernatants from overnight cultures of P. aeruginosa or E. coli. Pictures show the biofilm formation of CF1A-L in the absence or in the presence of culture supernatants of P. aeruginosa or E. coli as detected by crystal violet staining. (C) Relative number of SCV CFUs recovered after 6 h of growth for S. aureus CF1A-L in co-culture with PAO1 or K12 as determined using the double chamber co-culture model. (D) Relative expression ratios for the gene asp23 were evaluated by qPCR for CF1A-L in co-culture with PAO1 or K12. For B, C and D, results are normalized to unexposed CF1A-L (dotted line). Data are presented as means with standard deviations from three independent experiments. Significant differences between unexposed CF1A-L and the exposed conditions (*, P < 0.05; ***, P < 0.001) and between CF1A-L exposed to PAO1 or K12 (Δ, P < 0.05; ΔΔΔ, P < 0.001) were revealed by one-way ANOVA followed by the tuckey's post test. We used the pqsA and pqsL mutants derived from P. aeruginosa PA14 to further confirm the specific effect of HQNO on biofilm production by S. aureus. The pqsA mutant does not produce any 4-hydroxy-2-alkylquinolines (HAQs) at all [44, 45], whereas the pqsL mutant is specifically altered in HQNO biosynthesis . Thus, we have used both pqsA and pqsL mutants in order to distinguish the global impact of all P. aeruginosa HAQs from the specific impact of HQNO on biofilm production by S. aureus. Fig. 6A shows that the growth of the pqsA and pqsL mutants is not impaired compared to that of the parental strain PA14, thus excluding variations in supernatant composition caused by differences in growth rates among strains. Fig. 6B shows that the supernatant from an overnight culture of P. aeruginosa PA14 stimulates biofilm production by S. aureus CF1A-L in comparison to the supernatant from the pqsL mutant (specific HQNO-minus strain). The effect of different doses of supernatants from overnight cultures of P. aeruginosa PA14, the pqsA mutant, the pqsL mutant or E. coli K12 on biofilm production by S. aureus CF1A-L is shown in Fig. 6C. 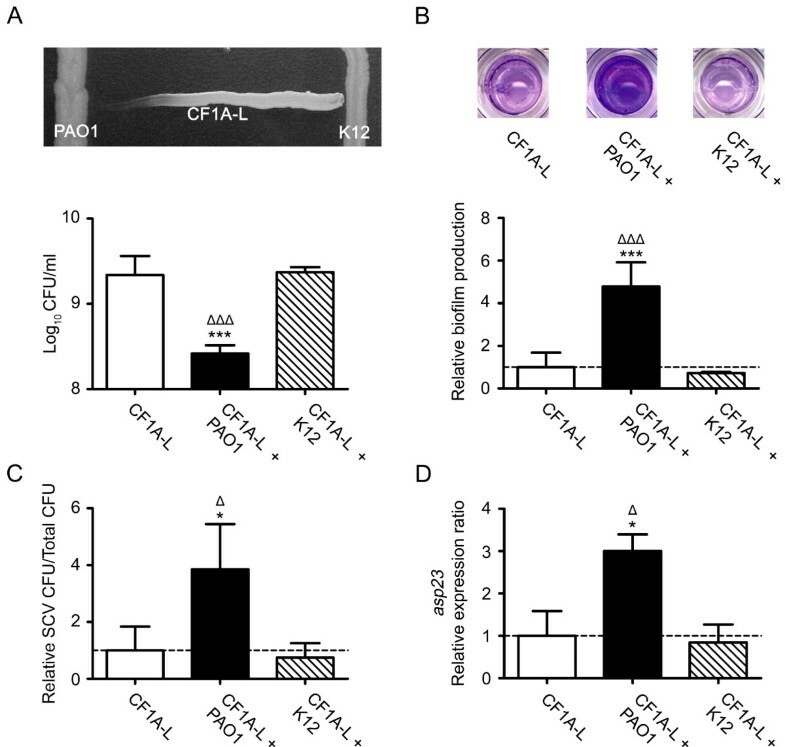 While supernatants from both mutants significantly induced less biofilm production in comparison to PA14, this attenuated effect was more pronounced for the pqsA mutant (negative for the production of all HAQs) than the pqsL mutant. This result can be explained by the fact that other HAQs secreted by P. aeruginosa, although less potent than HQNO, can also have a growth-inhibitory activity against S. aureus . Noteworthy, all three strains of P. aeruginosa stimulated biofilm production in comparison to E. coli, suggesting that other P. aeruginosa exoproducts can indeed stimulate biofilm production by S. aureus. HQNO from P. aeruginosa stimulates biofilm production of S. aureus strains by a SigB-dependent mechanism. (A) Growth curves of P. aeruginosa strain PA14 and the pqsA and pqsL mutants. (B) Pictures show relative biofilm production of CF1A-L in the absence or in the presence of supernatants from overnight cultures of P. aeruginosa PA14 or the pqsL mutant as determined by crystal violet staining. (C) Relative biofilm production by S. aureus CF1A-L as a function of the proportion of supernatant from overnight cultures of P. aeruginosa PA14, the pqsA mutant, the pqsL mutant or E. coli K12. Results are normalized to unexposed CF1A-L (dotted line). Significant differences between CF1A-L+PA14 and the other conditions for each proportion of supernatant are shown (*, P < 0.05; two-way ANOVA with Bonferroni's post test). 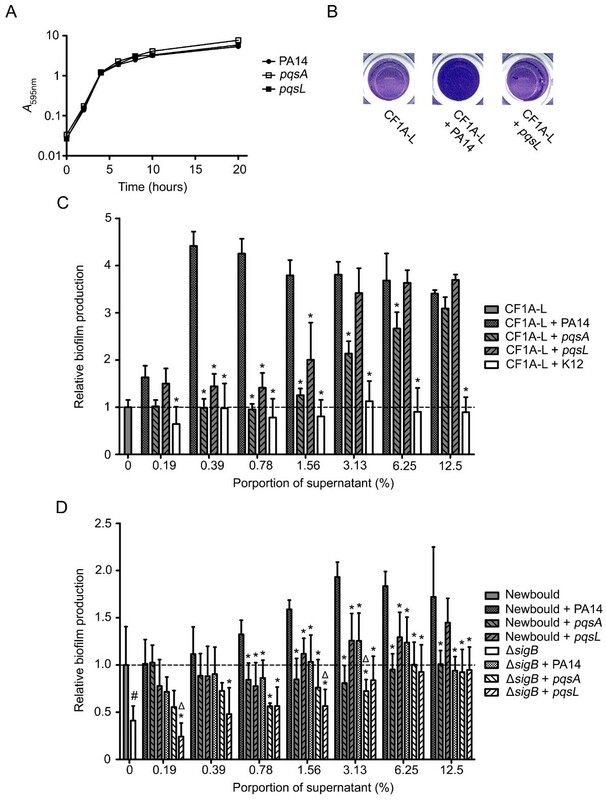 (D) Relative biofilm production by S. aureus strains Newbould and NewbouldΔsigB as a function of the proportion of supernatant from overnight cultures of P. aeruginosa PA14, the pqsA or the pqsL mutant. Significant differences between Newbould + PA14 and the other conditions for each proportion of supernatant (*, P < 0.05; two-way ANOVA with Bonferroni's post test), and between NewbouldΔsigB + PA14 and Newbould ΔsigB + the pqsA or the pqsL mutant (Δ, P < 0.05; two-way ANOVA with Bonferroni's post test) are shown. The significant difference between untreated Newbould and NewbouldΔsigB is also shown (#, P < 0.05; unpaired t-test). Data are presented as means with standard deviations from at least three independent experiments. Fig. 6D confirms that HQNO from the supernatant of strain PA14 stimulates biofilm production by a SigB-dependent mechanism. The increase in biofilm production observed when S. aureus Newbould is in contact with the supernatant from PA14 is significantly higher than that seen with supernatants from the pqsA and pqsL mutants. 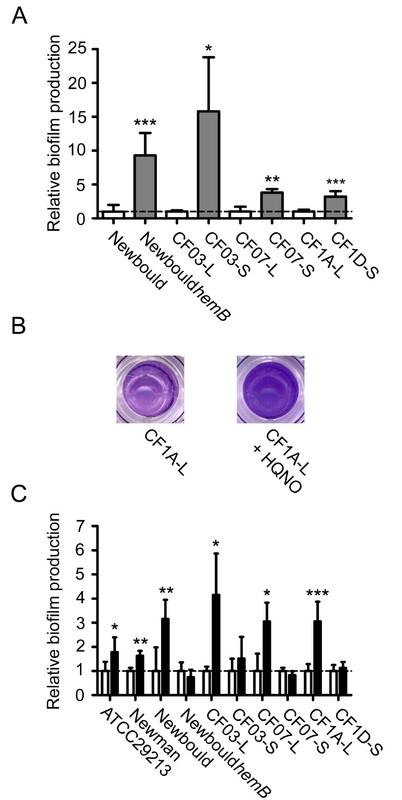 Surprisingly, both mutants did not significantly stimulate biofilm production by Newbould as that observed for CF1A-L, suggesting that differences between S. aureus strains may exist in respect to their response to the presence of non-HQNO exoproducts. As expected, biofilm production by NewbouldΔsigB in contact with supernatants from the three P. aeruginosa strains was significantly inferior to that observed using the PA14 supernatants with strain Newbould. Moreover, supernatants from PA14 generally did not significantly stimulate biofilm production by NewbouldΔsigB in comparison to supernatants from pqsA and pqsL mutants, which confirms that SigB is involved in HQNO-mediated S. aureus biofilm production. Overall, the results of this section support the hypothesis that HQNO from P. aeruginosa stimulates biofilm production by S. aureus through a SigB-dependent mechanism. We found that the P. aeruginosa exoproduct HQNO increases the production of biofilm by S. aureus. The effects on biofilm production, as well as on growth, were only seen on normal strains whereas the already high biofilm formation and slow growth rate of SCVs were not altered by the presence of HQNO. It is known that HQNO specifically inhibits electron transport in Gram-positive bacteria  and its immediate action toward normal strains is likely to reduce ATP production and growth to a similar level to that observed in SCVs. Interestingly, our results also indicate that HQNO provokes a sustained stimulatory effect on the production of biofilms by S. aureus. We indeed found that a pre-treatement of S. aureus with HQNO still led to a subsequent increase in biofilm formation even after HQNO removal. This sustained effect is probably associated with the increased proportion of the sub-population of SCVs resulting from HQNO exposure. An exposure of S. aureus to HQNO may thus, in addition to its immediate effect, favor the emergence of SCVs having a long-term impact on biofilm formation. Aminoglycosides are also known to favor the emergence of SCVs  and are often used in CF patient care . Interestingly, a synergistic effect between HQNO and tobramycin for the formation of S. aureus SCVs was previously observed by Hoffmann et al. . It is thus possible that the administration of aminoglycosides to CF patients co-infected with both S. aureus and P. aeruginosa further increases the formation of biofilm by S. aureus. Besides, it is well known that the abnormal function of the CF transmembrane conductance regulator (CFTR) protein in CF patients has profound consequences on the airway physiology and it will be of great interest to determine whether other parameters related to the CF airways influence the emergence of SCVs and the production of biofilms by S. aureus. The expression of virulence factors in S. aureus is indeed controlled by diverse and complex regulatory networks in a time- and environment-dependent manner, being influenced for example by ionic forces, pH and O2 . Consequently, it is likely that S. aureus specifically responds to the particular environment of CF airways. Whether this response is SigB-dependent and will lead to the emergence of SCVs and biofilm production remains to be determined. Naturally-occurring mutations altering the activity of virulence regulators in S. aureus have been previously reported [36, 49–52]. Our results suggest that the inactivation of sigB will importantly influence the outcome of the HQNO-mediated interaction between P. aeruginosa and S. aureus. We are currently studying S. aureus isolates from CF patients co-infected with P. aeruginosa which are not influenced by the presence of P. aeruginosa. This, in addition to the observation that differences between S. aureus strains exist relative to their response to HAQs (Fig. 6C and 6D), suggest that S. aureus strains isolated from CF patients may adapt or evolve toward a long-term coexistence with P. aeruginosa. Whether this involves mutations in sigB or any other genes encoding regulators is now under investigation and will greatly help to understand the dynamic behavior and the adaptation of S. aureus in response to the CF airway environment as well as to the presence of P. aeruginosa. The effect of HQNO on the regulators SarA, agr and SigB suggests that several virulence factors should be influenced by the presence of HQNO. A concomitant activation of SigB and repression of agr should result in the up-regulation of a variety of cell-surface proteins (such as FnBA) involved in adhesion to host tissues, and in the repression of several exotoxins (such as α-hemolysin, Hla) and proteolytic enzymes [22, 25]. It is then tempting to speculate that the presence of HQNO will prevent S. aureus from disseminating and will rather favor tissue colonization, biofilm production and invasion of host cells. It has indeed been suggested that S. aureus FnBPs mediates cellular invasion [53, 54] whereas the capacity of the bacterium to remain intracellular is helped by the repression of hla . Accordingly, we showed that an exposure of S. aureus to HQNO up-regulates the expression of fnbA and represses the expression of hla. However, whether or not HQNO and P. aeruginosa increase the invasion of host cells by S. aureus remains to be confirmed. Interestingly, O'Neil et al. have recently demonstrated that the FnBPs are also involved in the ica- independent mechanism of biofilm formation. It is thus possible that FnBPs are directly responsible for the observed HQNO-mediated SigB-dependent increase in biofilm production and, more specifically, FnBPA which is under the control of SigB for expression [15, 19, 22, 37]. As such, the FnBPs would represent the main effectors for both biofilm formation and cellular invasion in S. aureus SCVs. HQNO may be one of several bacterial exoproducts influencing S. aureus during polymicrobial infections. Our results and those of Machan et al. suggest that other HAQs may also affect S. aureus, although not as efficiently as HQNO. Moreover, it is known that other P. aeruginosa exoproducts such as pyocyanin have an inhibitory activity against the electron transport chain of S. aureus . Loss of pyocyanin production has been associated with mutations in the pqsA-E genes [45, 56], which may provide an additional explanation for the different effects of the pqsA and pqsL mutants we have observed on the growth (data not shown) and biofilm formation of S. aureus (Fig. 6C). Furthermore, Qazi et al. found that an N- acyl-homoserine-lactone from P. aeruginosa antagonizes quorum sensing and virulence gene expression in S. aureus. More precisely, it was shown that the 3-oxo-C12-HSL interacts with the cytoplasmic membrane of S. aureus and down-regulates both sarA and agr expression. Although we also observed here a down-regulation of agr, the HQNO-mediated up-regulation of sarA suggests further complexity in the response of S. aureus to P. aeruginosa exoproducts. It is possible that the outcome of the S. aureus-P. aeruginosa interaction is dependent on the amount and the types of exoproducts secreted by the specific strain of P. aeruginosa interacting with S. aureus. It should be kept in mind that the diversity of diffusible bacterial signals and their role in interspecies communication are just beginning to be appreciated  and that potentially numerous other bacterial species may be interacting with S. aureus, especially during infectious diseases. It is then likely that S. aureus interacts with other bacterial genus than Pseudomonas during infection of the airways of CF patients. As an example, the CF pathogen Burkholderia cepacia also produces N-acylhomoserine lactones  and some Burkholderia species are able to synthesize HAQ analogues . Nevertheless, the observation that P. aeruginosa favors the emergence of SCVs and biofilm production by S. aureus is likely to have a significant clinical impact. The clinical consequences may actually surpass the previously anticipated formation of aminoglycoside-resistant SCVs by Hoffman et al. . Persistence of bacteria in chronic infections has been associated with biofilm production [1, 59] and biofilms are known to confer protection from host defenses and antibiotic treatments at large [34, 60]. In the cystic fibrosis context, where obstructive infections worsen the health prognosis of patients, the clinical significance of biofilm production by normal S. aureus and SCV strains will need to be further investigated. This study strongly supports the hypothesis that P. aeruginosa influences the pathogenicity of S. aureus by producing HQNO, which favors the acquisition of the SCV phenotype through the activation of the stress- and colonization-related S. aureus alternative sigma factor B. Although several P. aeruginosa exoproducts may potentially influence S. aureus, our observations with pure HQNO were confirmed and supported by experiments using whole supernatants from two P. aeruginosa strains as well as mutants unable to produce HQNO. Considering that biofilms and SCVs are both suspected to play a role in chronic infections of CF airways, the observation that P. aeruginosa increases the emergence of SCVs and biofilm formation by S. aureus may influence the patient health prognosis. New therapeutic strategies should aim at preventing interspecies interactions and the development of specific phenotypes such as biofilm-producing SCVs in order to reduce the likelihood of chronic infections. The relevant characteristics of the strains used in this study are shown in Table 1. Staphylococcus aureus ATCC 29213, Newman and Newbould were used as representatives of prototypical control strains. NewbouldΔsigB and NewbouldhemB, in which the genes sigB or hemB had been disrupted by the ermA cassette [15, 17], were used to evaluate the importance of SigB in a prototypical background and to generate a stable SCV, respectively. CF03-L/CF03-S, CF07-L/CF07-S and CF1A-L/CF1D-S are related pairs of strains co-isolated from CF patients, which respectively have a normal and a SCV phenotype. The genetic relatedness of each strain among the pairs was confirmed by the analysis of multiple loci with a variable number of tandem repeats (see below). Except where otherwise stated, S. aureus strains were grown in brain heart infusion (BHI) broth (BD, ON, Canada). The use of BHI to study our SCV strains as well as in the experiments involving quantification of SCVs is validated in the Additional file 1. Pseudomonas aeruginosa PAO1 , PA14 , the PA14-derived pqsA and pqsL mutants [44, 46] and Escherichia coli K12 were grown in trypticase soy broth (TSB) (BD, ON, Canada). The relatedness of each of the co-isolated strains within the pairs CF03-L/CF03-S, CF07-L/CF07-S and CF1A-L/CF1D-S was confirmed by MVLA as described by Sabat et al. . The strains of each pair had identical MVLA patterns. S. aureus overnight cultures were used at an A595 nm of 0.1 to inoculate BHI broths supplemented or not with 10 μg/ml of HQNO (Axxora, CA, USA). Cultures were then incubated at 35°C/225 RPM and samples were taken at different time points for determination of CFU by spreading 10-fold dilutions on trypticase soy agar (TSA) plates (BD, ON, Canada). Plates were incubated at 35°C for 24 and 48 h for normal and SCV strains, respectively. For the growth curves of P. aeruginosa PA14 and the pqsA and pqsL mutants, overnight cultures were used to inoculate TSB. Cultures were then incubated at 35°C/225 RPM and samples were taken at specified time points in order to evaluate their turbidity at A595 nm. We have quantified SCVs by taking advantage of their reduced susceptibility to aminoglycosides as described elsewhere with few modifications [20, 64, 65]. A 1:100 dilution of overnight broth cultures was used to inoculate BHI broths supplemented or not with 10 μg/ml of HQNO. Cultures were incubated 18 h and then adjusted to an A595 nm of 2.0 in PBS at 4°C. Determination of SCV CFUs was done by serial dilution plating. SCV counts were obtained by plating on TSA containing gentamicin (Sigma-Aldrich, ON, Canada) at 4 μg/ml followed by an incubation of 48 h at 35°C. As shown in Additional file 2, this concentration of gentamicin is selective for SCVs as it allows the growth of SCVs, but not that of normal strains. The frequency of SCVs is defined as the number of SCVs per total CFU counts on antibiotic-free TSA. The pinpoint colonies detected by this gentamicin-plate method were confirmed to be SCVs by streaking several of them on TSA plates (See Additional file 3). We have also evaluated the auxotrophism (as described below) of several HQNO-induced SCVs generated from strains CF1A-L and CF07-L in order to further validate the ability of this technique to detect typical SCVs (see Additional file 4). The minimal inhibitory concentrations (MICs) of gentamicin for all strains were determined by a broth microdilution technique, following the recommendations of the Clinical and Laboratory Standards Institute (CLSI) guidelines , except that the incubation period was extended to 48 h and that the medium used was BHI in order to allow SCVs to reach maximal growth. In the context of SCVs, auxotrophism is defined as the requirement of specific compounds in order to regain a normal growth phenotype . An agar diffusion method was used to characterize the auxotrophism of SCVs using hemin or menadione (10 μg each/well) on an inoculated Mueller-Hinton agar (MHA) plate. Thymidine at 1.5 μg/well was also tested as previously described . Auxotrophy for specific supplements was detected by a zone of normal growth surrounding the well after 18 h of incubation at 35°C. The photography of the Additional file 5 shows the normal growth of NewbouldhemB in proximity of a well loaded with hemin as an example of a positive auxotrophism result. Overnight cultures were used to inoculate TSB at a dilution of 1:100. Cultures were then incubated 20 h at 35°C/225 RPM before collecting the culture supernatants by centrifugation. Similar culture conditions were previously shown to allow maximal production of HQNO by P. aeruginosa PAO1 . The supernatants were then filter-sterilized using 0.22 μ pore size (Millipore, MA, USA) and used immediately. The sterility of the supernatants was confirmed by plating samples on TSA plate. For studying the effect of HQNO on biofilm production by S. aureus, three colonies grown on blood agar plates were used to inoculate BHI broths containing 0.25% glucose with or without 10 μg/ml of HQNO and cultures were incubated for 18 h. These cultures were used to adjust an appropriate volume of BHI-0.25% glucose to 0.5 Mcfarland for transfer into wells of a flat-bottom polystyrene microtiter plate containing half volume of the same medium with or without HQNO (final concentration 10 μg/ml). For experiments evaluating the effect of culture supernatants from P. aeruginosa and E. coli on S. aureus biofilm production, a S. aureus 0.5 Mcfarland suspension was prepared in BHI-0.5% glucose and transferred into wells of a microtiter plate containing half the volume of the supernatant to be tested. The plates were incubated at 35°C for 48 h. The supernatant was then discarded and the wells were delicately washed three times with 200 μl of PBS. The plates were dried, stained for 30 min with crystal violet, washed twice with 200 μl of water and allowed to dry again. A volume of 200 μl of 95% ethanol was added to each well and plates were incubated at room temperature for 1 h with frequent agitation. The absorbance of each well was then measured at 560 nm using a plate reader (Bio-Tek Instruments). The biofilm formation of each culture tested was evaluated in four replicates. The A560 nm values (non-normalized data) representing the biofilm production for each of the strains used in Fig. 2 can be seen in the Additional file 6. Reaction mixtures were denatured for 10 min at 95°C, followed by 35 cycles of 30 s at 95°C, 1 min at 60°C and 1 min 30 s at 72°C. Dissociation and standard curves were obtained to insure the specificity and the efficiency of reactions. cDNA synthesis reactions without reverse transcriptase were also routinely carried out. The relative expression ratios were calculated by using the cycle threshold (Ct) of the 16S RNA or gyrB of each condition as the calibrator (n-fold expression = 2-ΔCt, where ΔCt represents the difference between the Ct of the gene studied and the Ct of the 16S RNA or gyrB for each condition). Overnight cultures of S. aureus, E. coli and P. aeruginosa in TSB were used to inoculate bottom (S. aureus, E. coli or P. aeruginosa) or top (S. aureus) chambers of 0.4-μm pore polycarbonate membrane inserts (Transwell [Corning, MA, USA]). S. aureus was inoculated at an A 595 nm of 0.01, whereas P. aeruginosa or E. coli were inoculated at an A 595 nm of 0.1. The cultures were incubated at 35°C/80 RPM for 6 h and samples were taken for SCV enumeration and total CFU counts as well as for RNA extraction. No bacterial cross-contamination was detected by culture plating up to at least 9 h of incubation. One-way analysis of variance followed by Dunnett's multiple comparisons test or Tukey's multiple comparisons test were used when several conditions or strains were compared at the same time whereas unpaired t-tests were used when only two conditions were compared. Two-way ANOVA with Bonferroni's post tests were used to compare the response of different strains and/or different conditions as a function of the concentration of HQNO or bacterial culture supernatants. Statistical analyses of qPCR data were done on mean ΔC t . CFU counts or SCV frequencies were transformed in based-10 logarithm values before being used for statistical analyses that were carried out with the GraphPad Prism Software (v.5.00). Statistical tests used for the analysis of each experiment are specified in figure legends. The authors would like to thank Eric Brouillette for helpful comments. We also thank the personnel from the CF outpatient clinic and from the clinical microbiology laboratory of the CHUS for analysis of CF patient samples and initial characterization of S. aureus. This study was supported by a grant from the Canadian Cystic Fibrosis Foundation. G.M. is a recipient of an Alexander-Graham-Bell Graduate Scholarship from the Natural Science and Engineering Research Council of Canada. GM, DLS and AEA carried out the experiments. GM, DLS, ED, AMC, EHF, SM and FM designed and conceived the study. GM and FM wrote the paper. All authors read and approved the final manuscript.